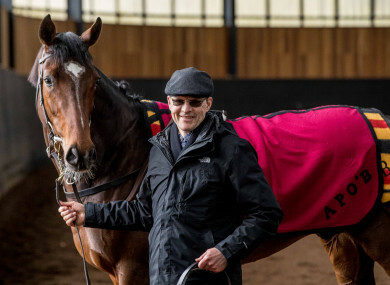 Aidan O'Brien at the renowned Ballydoyle. He is joshing, sharing some off-the-record yarns, utterly at ease. When he tells you he enjoys training now more than at any other time in his life, it is evident. You know too it is on far deeper level than just because he is breaking more records than can be contained in a Guinness book, though not wondering if you can pay the feed bill at the end of the month is a definite help. Still, it’s visceral. It is all he does because it is what he is. Those thinking he is some sort of robot are sadly, badly mistaken. His leading 2,000 Guineas contender, Ten Sovereigns is going to go straight to Newmarket we are told. John Gosden, who was once assistant to Vincent O’Brien at Ballydoyle, trains the favourite Too Darn Hot. Gosden’s son Thaddy spent a few months with Aidan’s son Joseph, who is actually setting a quicker pace than his father did since turning his hand to training. Thaddy was blown away by how we celebrate our breeders here, having attended the ITBA Awards – apparently the English take less notice of the small, independent operators, of the one- and two-mare variety. Of course primarily, Thaddy was around to learn the ropes. Not that he wouldn’t know them, shadowing his own father the same way Joseph did Aidan. But you can always pick something new up and if Aidan reckons he is always learning, nobody can claim to know it all. He has become a near-mythical figure but if he is a genius with horses, the explainer his secretary Polly typed, printed and sellotaped on the wall next to his desk in the racing office reveals much that is beyond his ken. How to use Racing TV. Just in case you think he is infallible. And of course he is not. This is horse racing and so of course he gets it wrong. And getting it wrong doesn’t bother him for two reasons. He will survey the evidence and attempt to learn why, so that the mistake won’t be repeated. And then, at the core of it all, is the knowledge that everything had been done to attempt to make the right call and that the wrong decision might have been made initially, for the right reason. “When things go wrong and you do your best it’s never a problem and you can accept it very easily. When things go wrong and you feel like you didn’t do your best, that’s when it gets you. His commitment is total, rising at 5am and never rejecting a phone call or not calling a missed one back. Deal with it, whatever it is, and don’t have it hanging over you. Then you can move on. “I love being here. I look forward to being here every morning. I’d very rarely not be here. We always come back. We never stay anywhere really (when racing abroad). I’m in the lucky position that I look forward to getting up to come out to the horses, every single morning. It’s what I love doing. Every single morning is different and new. “I don’t do anything else. I don’t have any other interests. Not a thing. The only time I’m not here is if I’m at the races. You need the time. You need every minute of the day to get it all together. Then you have to keep yourself as mentally and physically, as fresh and clear as you can so that when you get the information, you can make the decision. Take the virus that affected the yard for a spell last year. “I would look back and see how it happened and why it happened. We might have made decisions (which led to) how it came in here. So we would try change them but I would be very happy that at the time we thought we were doing the right thing when we made those decisions. He doesn’t set individual targets – “my target is to be alive this time next year” – but his job is to have plenty of stakes winners with his two- and three-year-olds in particular, so that Coolmore can keep their global breeding industry thriving. But there is never a sign that he is feeling the pressure of that. Boasting the ridiculous CV he does as 21-time champion trainer in Ireland, six-time champion in Britain, with 313 Group/Grade 1s on the flat and 22 Grade 1s over jumps, 78 classics and so on, is probably a reasonable buffer but you would doubt he could reel off those statistics, unlike some other well-known trainers. That isn’t his motivation. “I look forward to it now more than I probably ever did before. I suppose as we get older we feel like we have more experience and more knowledge and we can handle situations a bit better than we would have 20 years ago. “When you’re giving every minute of the day, you have to do it in a way that you enjoy it and everyone else enjoys it, or you won’t last. “Do you know what? I’m very conscious and very grateful about getting every single day here because life is short. If people only realised how short. When today is gone, you don’t’ get it back and I don’t take any day for granted. Though some parents struggle to put the right name on their children first thing in the morning, every work rider and member of staff gets that personal touch. That roster of riders is stellar. This morning you have Adrian Maguire (Gold Cup-winning jockey), Alan Crowe (dual Grade 1-winning jockey), Ben Dalton (Grand National-winning jockey), Dean Gallagher (Champion Hurdle-winning jockey), Padraig Beggy (Derby-winning jockey), Seamie Heffernan (multiple classic-winning jockey), Donnacha O’Brien (champion jockey) and Wayne Lordan (multiple Group 1-winning jockey) on duty. “It’s all about the people” as the boss keeps emphasising. Ryan Moore is number one jockey, even if son Donnacha is champion and O’Brien will make the final call about who rides what, though he admits he might not always be sure and will say that to Moore if in doubt. He is effusive in his praise of the English rider though and knows there are no worries if a so-called second or third string prevails as is often the case, because his man is a team player. If he wasn’t, he wouldn’t be around. “We’ve brought over Ryan more this year to help him to get to know the horses more. I am conscious he has a young family and I don’t want to be dragging him over too much but it is good to get a feel for the horses, although to really know the horses you have to ride them in races. “We think we have the ammunition but it’s changing all the time. All you’re trying to do is keep it settled. It’s moving left, it’s moving right. When you have it right, you’re trying to keep it in the centre but I’m sure it’s the same for anyone training athletes or teams. More manageable for some than others. Email “Appreciating every day and trying to work Racing TV: visiting Aidan O’Brien's Ballydoyle yard”. Feedback on “Appreciating every day and trying to work Racing TV: visiting Aidan O’Brien's Ballydoyle yard”.